If you have lost teeth, our dentists offer both complete and partial dentures to patients in the Mount Pearl community. Complete dentures are placed in your mouth immediately after all your teeth are removed. A complete denture can take between 6 to 12 weeks to complete. First, we take an impression of the upper and lower arches of your mouth to establish your dental structure. We then help you select the shape and color of your new denture teeth. During the next visit, we check the appearance and functionality of your dentures. Sometimes it is necessary to repeat this step to ensure that everything is just right for you. After fit and appearance are achieved, we send the denture for fabrication. Partial dentures can be removed from your mouth. A partial denture attaches to your existing teeth via a clasp or some other retaining device. Making a partial denture requires about 6-8 weeks. We begin by preparing the supporting teeth. Next, we take an impression of the upper and lower arches of your mouth and record your bite. At the subsequent visits, we check the appearance and function of the partial denture teeth and gums. There are newly developed techniques in making partial dentures. One such advance is an implant-supporting denture that gives additional support to the partial denture. 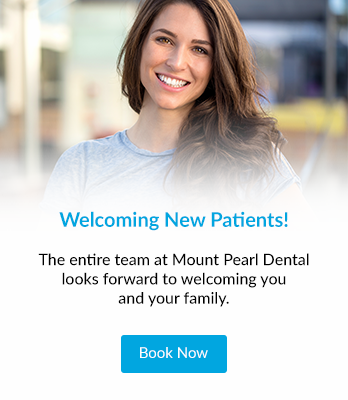 Our friendly team at Mount Pearl Dental will ensure that you choose a denture solution that is the best fit for you.